We study supersymmetric extensions of the Standard Model with small R-parity and lepton number violating couplings which are naturally consistent with primordial nucleosynthesis, thermal leptogenesis and gravitino dark matter. We consider supergravity models where the gravitino is the lightest superparticle followed by a bino-like next-to-lightest superparticle (NLSP). Extending previous work we investigate in detail the sensitivity of LHC experiments to the R-parity breaking parameter ζ for various gluino and squark masses. We perform a simulation of signal and background events for the generic detector DELPHES for which we implement the finite NLSP decay length. We find that for gluino and squark masses accessible at the LHC, values of ζ can be probed which are one to two orders of magnitude smaller than the present upper bound obtained from astrophysics and cosmology. S. Ovyn, X. Rouby and V. Lemaitre, Delphes, a framework for fast simulation of a generic collider experiment, arXiv:0903.2225 [SPIRES]. 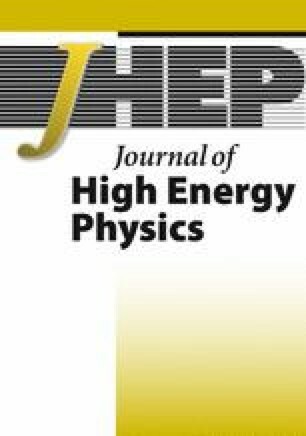 W. Beenakker, R. Hopker and M. Spira, PROSPINO: A program for the PROduction of Supersymmetric Particles In Next-to-leading Order QCD, hep-ph/9611232 [SPIRES]. The ATLAS collaboration, G. Aad et al., Expected Performance of the ATLAS Experiment. Detector, Trigger and Physics, arXiv:0901.0512 [SPIRES]. N. Kidonakis, Top quark pair and single top production at Tevatron and LHC energies, PoS(ICHEP2010)059 [arXiv:1008.2460] [SPIRES]. J. Alwall et al., Madgraph: http://madgraph.hep.uiuc.edu/.